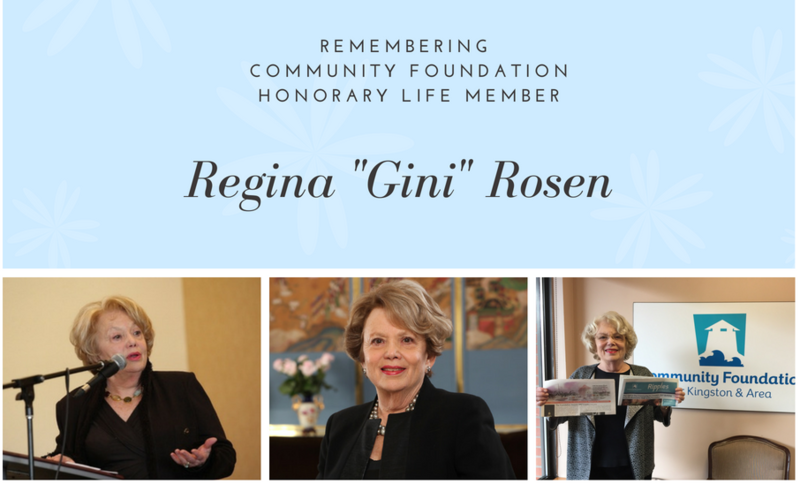 It is with sadness that I share the news that a beloved member of the Community Foundation “family” passed away this week – Regina (Gini) Rosen. Her obituary and details about the funeral and Shiva/Visitation to follow can be found by clicking here. Gini has been at the heart of the Community Foundation since its very beginning. She was instrumental in its creation, growth, and success. Her roles and contributions are almost too many to mention, but amongst her major contributions were serving as President of the Board of Directors, Editor of our Ripples publication for 20 years (since its inception) and being the visionary and key lead behind four major fundraisers which collectively raised nearly $1 Million for the Foundation: The Tragically Hip Benefit Concert “Across the Causeway” (2004), the Tenth Anniversary Black & White Gala (2006), “Under the Big Top” (2012) and “Jailhouse Rock” (2015). She was named as an Honorary Life Member in 2004 for her numerous and exceptional contributions to the Foundation. But more important than “what” she did was “who” she was. Gini was one of the most generous, kind, intelligent, articulate and classy women that I know. When Gini walked into a room, you knew it! She had a wonderful way of recognizing everyone’s presence and energizing and inspiring a group to rally behind a project or cause. It was truly an honour to work with and learn from her. Gini was a true philanthropist, supporting many causes and organizations. But more than that she was passionate leader and advocate for making her community better. She loved the word “communitarian” – representing the connection between a person and their community. Gini was a true “communitarian” and an inspiration to all of us for how we can work together to better our community. Gini was full of boundless energy, and when she put her mind to a project she got it done (and don’t even think of standing in her way)! She in her 70s and me in my 40s I would say to her often “I wish I had half your energy at my age”. I don’t know how she did it, but she was always engaged in big projects with a smile on her face (and her agenda in her hand to schedule the next meeting!). Remarkably, she operated well at all levels – from the strategic and creative conceptualization of something, to rallying the troops, to rolling up her sleeves to do the work to get the job done. You can click here to read an inspiring speech Gini delivered about the Community Foundation; its history, impact, and the role we all have to play, emphasizing that “Together is the operative word. It is a collaborative effort in every way.” She spoke in true Gini style – articulately, passionately, intelligently, and philosophically – but all geared towards taking action. One of her passions was the Regina Rosen Food First Fund, which the Board of Directors named in her honour in recognition of her exceptional involvement in the Foundation. The “RRFFF” provides one $1,000 grant each month to support a different community food-providing organization in support of a self-identified project or immediate requirement. She was chair of the committee that oversaw the granting from the fund and, passionate about the cause, she was adamant about working to ensure that there will be enough resources in place to keep it viable in perpetuity. Funds donated to this fund are divided equally: half is endowed to ensure future income for granting, and half is available for granting now. You can click here to read about “Gini’s Fund”, including an article written by her. And you can click here to make a memorial donation. Kingston has lost an incredible leader, but her legacy will live on in so many areas of the community that she helped to build and strengthen. We are all better for having had her as part of our community. She will be greatly missed but never forgotten. Our collective thoughts are with her family at this difficult time. Tina Bailey, on behalf of the Community Foundation team.